This was by far and away the biggest and most audacious challenge that I’ve ever taken on. The only things that can compare as being as scary was the leap into the unknown that I made in August 1981 when I married as pimply faced 19 year old, and the equally huge leap of faith made just over 8 years later when I became a proud parent for the first time. Whilst I know it’s poor form to start with an apology, I would like to do so, because I know how precious everyone’s time is, and how we’re bombarded with information overload, these days. So please accept my apologies for this post as given the enormity of the physical and mental challenge of the Triple8 project it’s going to be a “War & Peace" like story. I have followed the structure intended by a certain Geoffrey Chaucer in his literary epic known as The Canterbury Tales. The only difference is that his tale (a series of 24 stories - he intended to write 120) ran to 17,000 lines of text (I promise mine will not be as long) and did not have an Epilogue. The reason for this was that he still had 96 stories still to tell of course, and died at, what is considered today, the tender age of 57 (the year that ironically I am now in) but which was as “common as muck” during the Middle Ages (1300-1400) when he put pen to paper. For those that just want the headlines though suffice it to say that just over a week ago I was waking up from some much needed sleep having successfully completed the Triple8 Challenge (a 444km run single stage road run across Peninsular Malaysia followed by a 444km cycle back to the start line in the space of 7 days) that a few friends and I dreamt up earlier this year for ourselves. 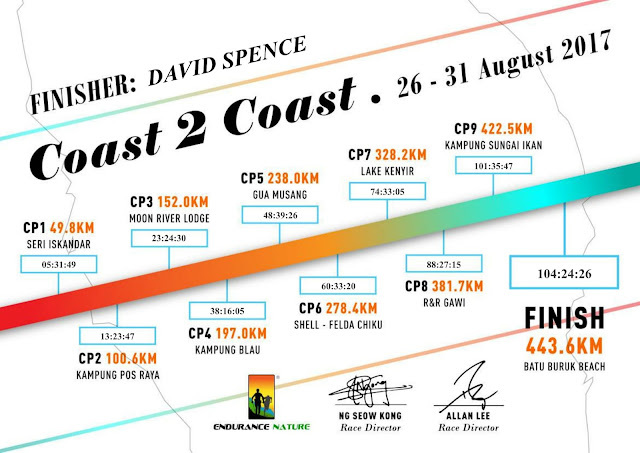 As you’ll see this involved us participating in what was the inaugural Coast 2 Coast event developed and designed by some Ultra Running Legends here in Malaysia called Allan Lee & Ng Seow Kong. 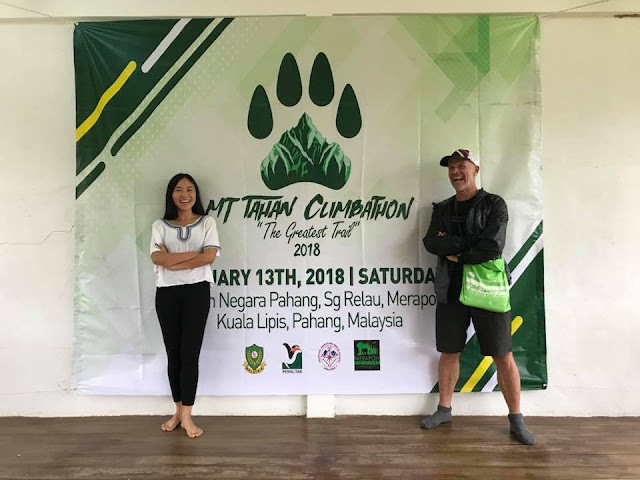 They are friends of mine who run an event business known as Endurance Nature. The event like all new extreme challenges attracted only a small group of runners (11). However, the field was stacked with Elite Ultra Runners whose experience and pedigree was far superior to ours as was many of their support vehicles which had been modified and kitted out specifically for events like this one. By comparison we were relative novices at ultra running as well as poorly resourced. We were not deterred by this though as from my experiences in multi-sport and adventure races over the years it’s amazing how many people have “all the gear...” and how easily intimidated by this we are. This I've learnt is a waste of energy and it is far better to focus on what you have. From our perspective I knew that we had 2 magical ingredients that others might not have. Namely, people and purpose. As we were a team of genuine and passionate volunteers and we had a common sense of adventure and 3 incredible causes that we were supporting. As a consequence, I was not the least bit surprised to find that we were the first team to make the traverse by some 5 hours which bought us a big bonus in term of time, as it allowed us to take a good rest (almost 30 hours) before starting the bike bit of the Challenge. During this time we did our laundry, recharged my batteries, filled up my tank with fresh fuel (My diesel was primarily in the form of several large and delicious Mango and Ice Cream Smoothies ;-), resupply our support vehicle and attend the inaugural Awards Dinner for the Coast 2 Coast event. We pushed off for the ride back at 23:16 on Thursday, 31 August and after a few short sleep breaks and more fuel stops got back at the start line 24.5 hours later making our total journey time almost exactly 161 hours, which was comfortably (7 hours ;-) inside the self imposed deadline we’d set ourselves to do this of 7 days. As well as taking the inaugural title of being the 1st team home, we have also set an “unofficial” new world record for a double traverse of Peninsular Malaysia on foot and bicycle (based on the fact that we are the only idiots to have attempted it - so far ;-). Most importantly though, in the process we have raised slightly in excess of $16,000 USD for The Royal Marsden Cancer Hospital, Moor House School & College (a specialist home for children and young adults with speech and language difficulties) and a Legacy Fund set up in the name of a very dear and much loved local friend of mine who was suddenly snatched from us earlier this year that is supporting a shelter in Malaysia for woman and children who suffer from domestic abuse. You’ll notice that I have deliberately stressed the we in this post, as whilst it was me running and riding, despite all the training that I’ll tell you about in the next chapter, I genuinely and sincerely could not have done this without the handful of incredible people that supported me on this journey. Everyone of these Guys n one Gal definitely carried and lifted me out of any sniff of a darker moment that I might have had and, believe it or not, made the whole thing an incredibly pleasurable and joy filled experience. So much so that we are already planning (we actually started this before we finished because collectively we were having so much fun together :-) next year’s Challenge which you’ll need to read through to the Epilogue to discover how this is going to be bigger better and, we believe, raise many more $’s for deserving causes. Great write up Dave, and congratulations on the amount raised that's fantastic.